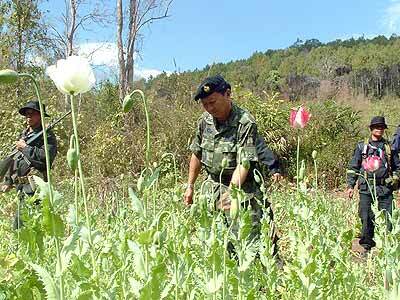 Maj. Gen. Kanittipon Mantaporn, Asst.Commissioner of Anti-Drug and Security Center of Third Army Region destroying opium. As the capital of Lanna kingdom, Chiang Mai is nowadays famed for its ancient temples, distinctive arts and crafts, scenery and unique Northern cuisine. Known as the main crafts center of Thailand, local artisans produce a wide variety of handicrafts such as wooden carving, silverware, lacquer ware, fabrics, ceramics and silk; reflecting centuries of Lanna expertise. 26.2 Miles, 42 kilometers, 112 laps around a 375 meter track. That was the goal for runners and walkers at the Piers Simon Appeal marathon at the Prem Center on February 4, 2006. The marathon was a fundraising event, which turned out to be a huge success, as over 200,000 baht was raised. 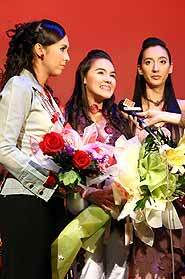 The three Thai-Italian Klongtruadroke sisters, Monique, Debbie and Karen, performed together for the first time in front of a packed house at Bangkok’s Thai Cultural Center. “Exchange on Earth”, the project in which French sculptor Paul Beckrich came to teach his technique of “transforming earth into metal”, will draw to a close this month. 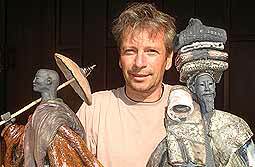 On February 19, at Insii Thai House, Maechan, it will be up to the guests of the garden party hosted by Count Gerald van der Straten Ponthoz to find out if this could be done.